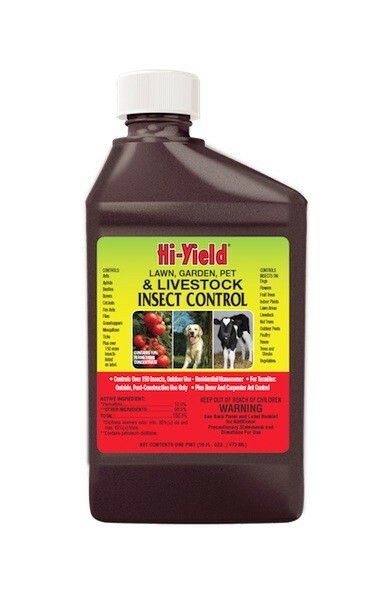 PRODUCT DESCRIPTION: This Permethrin concentrate is labeled for all kinds of pests for use on all kinds of plants including fruit and vegetables. Odorless and fast acting, it will both kill what is active as well as repel nuisance and destructive insects. This is essentially the same material as the PERMETHRIN 10% used for all kinds of pests in and around the home, yard and garden. WHERE TO USE IT: On target plants, shrubs, trees and basically anywhere nuisance pests are active. It can also be used on surfaces where flies and pests come to rest like the side of the home, window screening, trees and kennel areas. Some of the insects it will help to control and repel include (but not limited to) ants, aphids, bagworms, budworms, cankerworms, cicadas, citrus black flies, cluster flies, corn earworms, crickets, earwigs, elm leaf beetles, fall webworms, fleas, fungus gnats, gnats, gypsy moths, house flies, inch worms, japanese beetles, leafminers, leafrollers, moths, oak worms, mealybugs, mosquitoes, noseeums, sandflies, scale, solder mites, spider mites, tent caterpillars, thrips, ticks, tussock moths, whiteflies and over 100 more insects on the label. RATE OF APPLICATION: This will vary depending on where you're treating. For example, when treating vegetable or fruit producing plants, 1/4 to 1/2 oz per gallon of water is the recommended rate. When treating pets (dogs) or livestock for biting flies, fleas, ticks, etc., 6 oz per gallon of water used a spray or dip is recommended. And for use on the home or in turf for common perimeter invaders, use 2-4 oz per gallon of water; 1 gallon of mixed material will cover up to 1,000 sq/ft of surface area. We have straw itch mites in the hay we just purchased. It's all stored in a loft in a barn where the horses live. What can we use to get rid of them and be safe for the horses? What's the difference between the Vegetables Plus and the Essentria? Can a sprayer be used instead of a mister? Thanks. The two products you mentioned would be good choices to control itch mites. The Vegetables Plus is a permethrin based spray that can safely be used on garden vegetables and fruits that are consumed by people so therefore its plenty for safe on anything horses would eat. Just be sure to follow the "days to harvest" listing which is 7 days before you feed the hay to any animal. The Essentria IC is an even "safer" option. It uses food grade actives and won't pose any hazard to your horses. That being said, I'd let the treatment sit at least one day to be sure. Now you can definitely spray either product but straw itch mites, misting is strongly suggested. I say this for two reasons. One, using a mist means you can apply about 1/10th as much product compared to liquid spraying and yet you'll still get better results. Mist blowing will also save a lot of chemical costs over time. But the big thing is it greatly reduce the amount of chemical being placed on the hay and therefore, misting will result in a lot less exposure of either active to your horses so indirectly its a lot safer to apply any chemical – especially when treating something they'll be eating. Second, mist blowing works a lot better for itch mites since the mist will cover every bit of hay. Conversely, its not possible to do so with a liquid spray so the itch mites will invariably survive even the most thorough of treatments. The Veg Plus 10% Perm is an awesome product. I find that when it rains i do have to spray again, although we are infested with Gypsy moth caterpillars my yard and veggies are the only ones standing. The sprayer also helps as is squirts pretty high up. I make sure i get the tree trunks in the evening and the wood chips as i know they like hiding under those. All in all i find this product incredible, by the time i get to the side of the house i've started to see them dying. I had to buy 3 more as i have friends and family asking how i still have leaves in my yard. My boss even wants me to spray her house. Awesome Awesome Awesome.. AAAA++++ Thank you very much i'm sure you'll be selling many as i have been spreading the news around. Delivered as promised. I had an outstanding experience. Check out was simple. Shipping was well communicated and fast. The product arrived in one piece. I will definitely use this company again. Great Online Seller! I had a great experience with online seller!!! The seller kept me in the loop with the status and shipping of my product. The product arrived two days earlier than promised. Everything was delivered as promised. I'll be doing business with this seller again!!! Last year I had Leaf footed bugs in my tomatoes, will this spray control them? If so how often do I need to spray? In the article you'll see this Veg Plus concentrate is listed. In fact its a great product to use as will both kill and repel them. Use it once every two weeks if you're finding bugs on the plants. But once they're gone, once a month treatments will keep them from returning. Would this work on cucumber beetles? My plants are beginning to fruit and are quite large, will this kill the beetles on the plants and prevent new ones from snacking on my garden? This would be a good choice to both kill what's active and prevent new beetles from coming around.